You choose the color! Many colors to choose from! 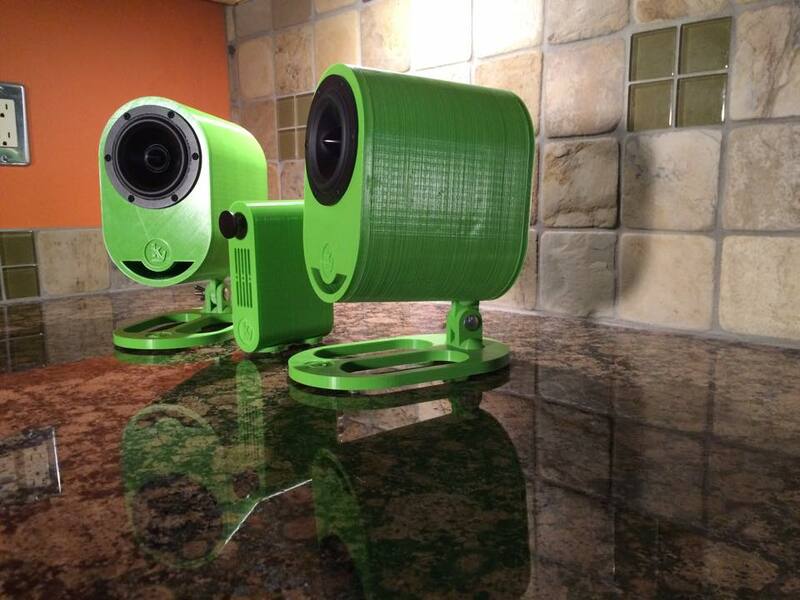 These self powered audio speakers are a perfect match for your iPod, mp3 player or computer. Just plug them in with supplied cords and let the smooth sounds begin. Matching 15 watt amp with volume control and orange LED power indicator lamp on front. 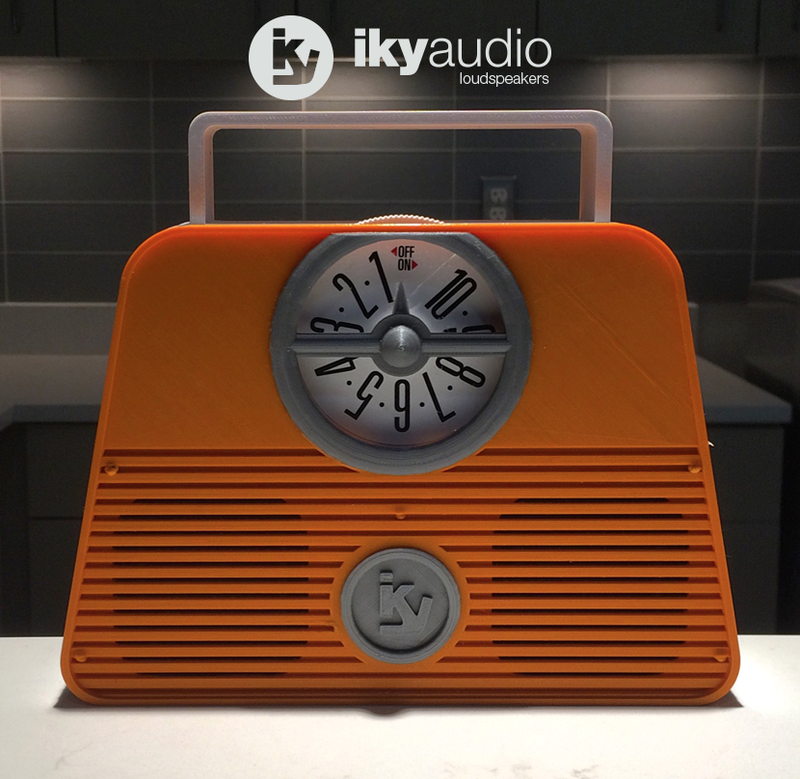 The ikyaudio soundpods were designed to be compact yet have a full sound and great imaging, giving a much bigger sound stage than their size portrays. 3D printed speakers and matching amplifier printed in PLA. 9 inch tall pods with a T-Line enclosure housing a 3 inch full range driver with an anodized aluminum cone for strong bass, exceptional clarity, detail, and dynamics—and of course, incredibly low distortion. Matching amplifier has a 15 watt Class-T Tripath audio chip to produce incredible fidelity and efficiency. Volume/On/Off knob with green LED power on indicator light. A rear mounted 3.5 mm stereo (1/8") audio input is provided. The amplifier also includes a 3 foot long, male-to-male 3.5 mm cable for making connections to iPods, MP3 players and PCs easy. Includes a pair of 6 foot long left and right speaker connectors. Just plug them in with supplied cords and let the smooth sounds begin. Matching 15 watt amp with volume control and green LED power indicator lamp on front. The ikyaudio soundspheres were designed to be compact yet have a full sound and great imaging, giving a much bigger sound stage than there size portrays. driver. This combination of driver and enclosure creates a rich, warm sound much like a pair of bookshelf speakers. The 60 degree angle of the driver sends all the sound to your ears. Magnetic shielding for safe placement near video sources. Due to the 3D printing nature of this product, minor imperfections may exist. FEDEX GROUND ONLY! Continental US only! For Alaska, Hawaii and International shipping must contact before purchase. Other colors made to order!